This post is brought to you by Legacybox. Okay you guys. This one is a game changer. You know that box in the back the closet? 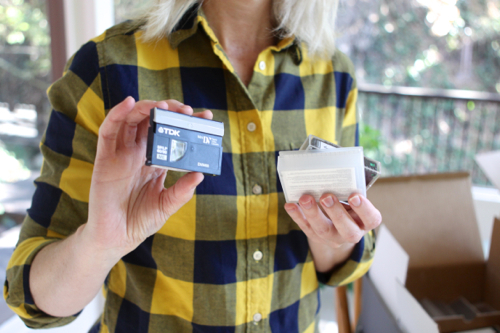 The one with photo negatives from the years before your first digital camera and the random camcorder tapes? What is even on those? And you know that shoebox at your Mom’s place? 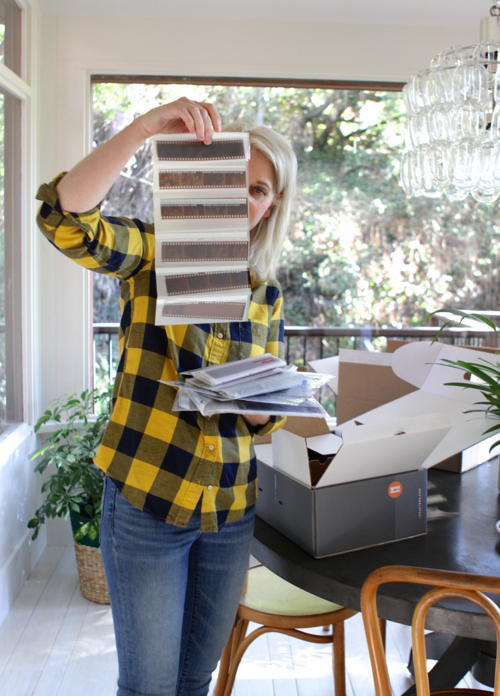 The one with the rolls of Super8 film, and the stacks of slides she inherited from Grandpa? Well pay attention, because I’m about to show you how turn those into high-quality, totally useable digital files. And all you need is Legacybox. It’s like magic! The reality is, almost all of us have those boxes, because technology changes so fast these days, that even something we used on a daily basis 10 years ago, might not be accessible anymore. Do you still have a VHS camcorder? Or a VHS player? Nope? Neither do we. But we did once, and it would be awesome to be able to watch the movies we made on those VHS tapes, right? Wouldn’t your kids love seeing those? Legacybox can handle pretty much any old, outdated format you can dish up. 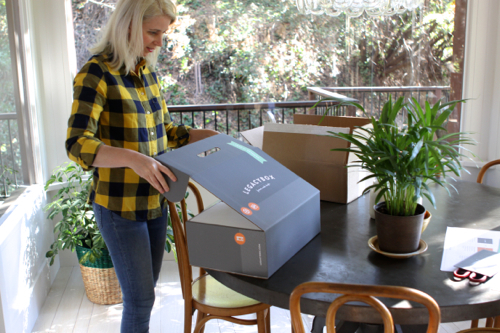 Sign up at Legacybox and they will send you a kit which includes a guide, round-trip shipping, a crush proof box, and access to a personal concierge so you can talk to an expert any time. 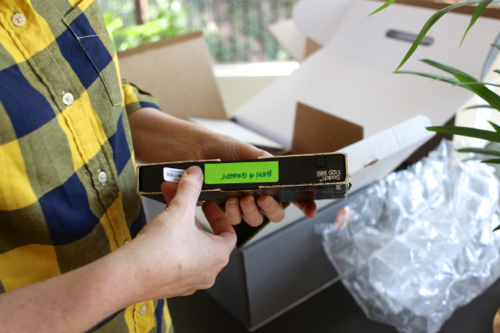 You fill the box with any formats in your collection — tapes, film, image negatives, whatever you’ve got — then send it back with their pre-paid label. Then, you go about your business. In a few weeks you’ll receive your originals back along with DVDs and digital files ready to share and enjoy! I’m telling you, it’s magical. One of my favorite parts, to make sure nothing gets lost or mixed up, the Legacybox kit includes barcode labels. 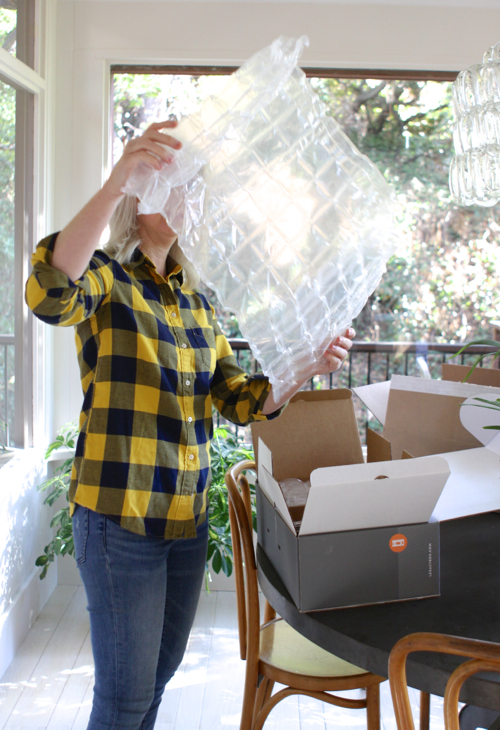 You add a barcode to every single thing you put in the box, and then you can track it all online to make sure your memories stay safe through the whole process. Such a treat for me to be able to see and easily share these images! Want to give it a try? I’ve got a BIG discount code for you! The first 50 people who you use the code DESIGN at checkout will receive 40% off their Legacybox! Tell me, Friends. If you were filling a Legacybox kit, what would you put in? 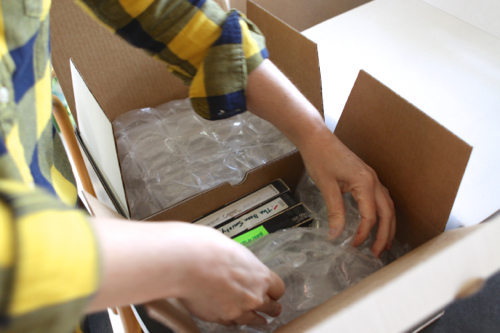 What tapes or images or film is waiting patiently in your storage? What footage have you not seen for 20 years? It’s fun to think about! I just bought mine. I have a box of tapes I have been holding onto for just a company like this. I can’t wait. Yay! So glad this post could help you mark something of your list. Thank you for the promo code! This is exactly what I have been looking for. 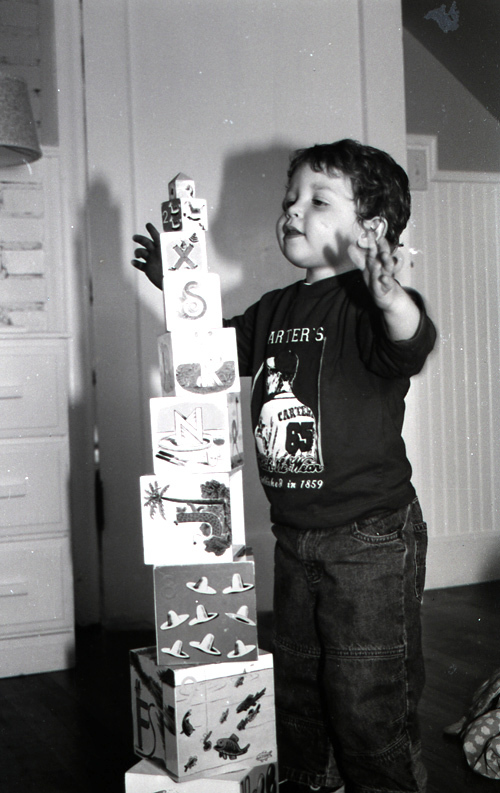 For years, I have wanted to get my mom some way to preserve old photos… but I don’t think she would want to do the work of scanning all the photos herself (and neither do I ;) ). It’s like the perfect Christmas present idea just fell into my lap! Hooray! I’ll bet your mom will be so delighted. I love this idea! I have so much that needs transferring! I’m in Aus, but will keep an eye out for a similar service. If I hear of anything, I’ll let you know! Totally unrelated, but where did you find that amazing shirt??! It’s one of my favorites! Super soft flannel from Uniqlo. I bought this one last year, but they have tons of cute patterns this year too. Olive just bought one in greens and blues. Wow! Thanks, Colleen. They are the high-rise skinny cut from the Gap. I love them! This is brilliant! I’ve really been wanting to do something with all our old 8mm videos and such but never really knew what to do. Thanks for sharing this! Yes! I mean I don’t even have way to play 8mm videos at all. Technology changes so fast! This looks like such an amazing company! 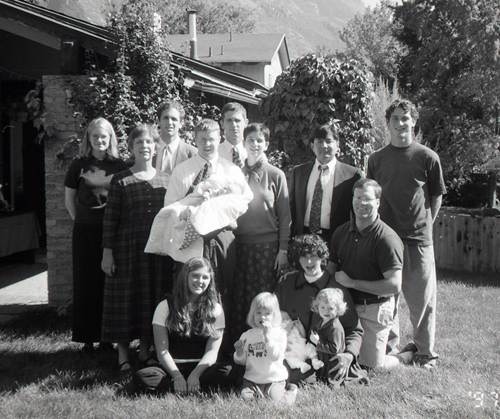 I definitely want to look into this and do something like this for my family! How fun! This is wonderful! Do they do photos or just movies/slides? I’d love to have all this stuff organized. When I saw this I was super excited thinking that 40% off was a deep discount and since it was only for the first 50 people, I had better act fast (good marketing!). Turns out the very next day they were offering 45% off. So 40% off was a good deal, but 45% the very next day would have saved me an additional $25. Such a bummer. Ugh. For real? Did you contact them? I wonder if they will honor the deeper discount. I agree it’s a total bummer!! I thought 40% was as deep a discount as they offered. Oh my goodness. This is just what my dad has been dreaming about for YEARS. What does Legacybox do with the original materials that you send to them? They send them back to you. I have used Legacybox last year and this year as well. I also gave it to my parents as a Christmas gift this year. They are a great company and have awesome customer service as well. I have copywritten VHS tapes that I want on DVD. Can you do that for me? After all, I did buy them. 1. Copyrighted videos won’t copy. 2. The greatest time spent in converting videos is editing, editing, and editing or you won’t enjoy the final product. Do you get the originals returned? What I would like to know is how much they charge for transferring old Super 8 tapes onto a DVD. I use Roxio vhs to dvd and it is great! I was really excited about the service when you introduced it to us, and quickly bought the largest option that they had. 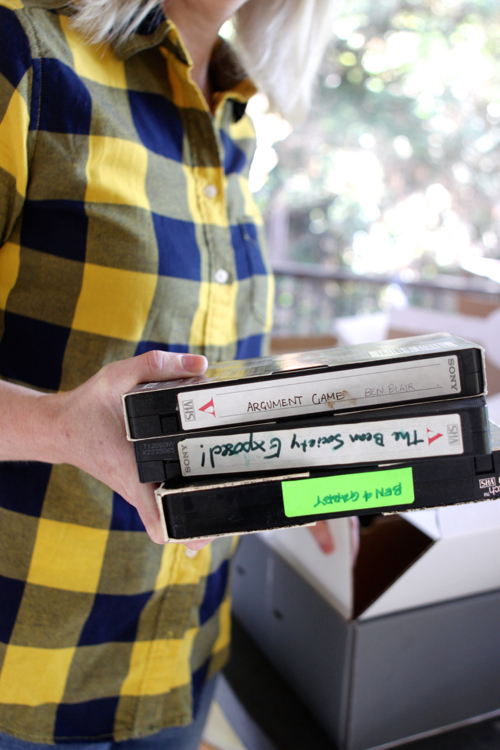 We have so many videos to digitize! Unfortunately, they have lost Our order of 21 precious home videos, and the customer service has not been giving us any answers as to their whereabouts. It seems like a great concept, until something goes wrong. And unfortunately, they don’t save a copy of what they digitize, even temporarily. So you send the originals to them, and they hopefully send the originals back with the digitized copies. But items can get lost on any step of the process. Which is what we discovered. And our home videos cannot be recovered. We will now only be working with local companies to digitize are heirlooms, even though that might cost a little bit more. Just wanted to let your other readers know, so they can be informed of the risks when making a decision. has anything changed? have you received anything? I have had some VHS tapes converted to digital, but the quality is very poor. Do you know if the quality has this improved with the Legacy Box? 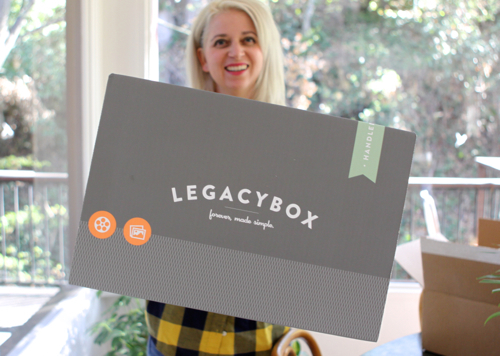 I was very careful selecting legacy box and read so many wonderful reviews. My level of confidence in their service was very high as I labeled and mailed off just as instructed my sons precious memories from when he was a toddler (now age 19) that were filmed on VHS. As other customers have mentioned, that’s it, your original is gone. I entrusted throughout the process everything was “under lock & key” because of emails I would receive step by step. Until one day , a very strange email, read extra charges would applied to order for larger quantity; different from what I mailed to legacy box. has anything changed? 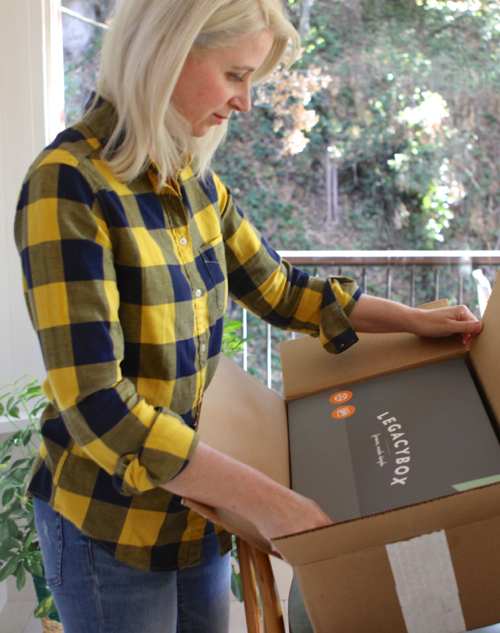 Have you received your box back with the final products? of info. I am happy that you just shared this helpful info with us.